Puff Pastry-3 Machine and Equipment - ANKO High Efficiency Puff Pastry-3 Production Equipment Design | ANKO FOOD MACHINE CO., LTD. In baking, a puff pastry is a light, flaky, unleavened pastry containing several layers of fat which is in solid state at 20 °C (68 °F). In raw form, puff pastry is a dough which is spread with solid fat and repeatedly folded and rolled out (never mashed, as this will destroy layering) and used to produce the aforementioned pastries. It is sometimes called a "water dough" or détrempe. The gaps that form between the layers are a result of the puff pastry rising as the water evaporates into steam during the baking process. Piercing the dough will prevent excessive puffing, and crimping along the sides will prevent the layers from flaking all of the way to the edges. The machines listed below are designed for making Puff Pastry-3. Please feel free to contact us via the form below. We will happy to answer any questions you may have regarding our products, services, and turnkey projects. ANKO's customized production line comes in different specifications, suitable for different types of food businesses. 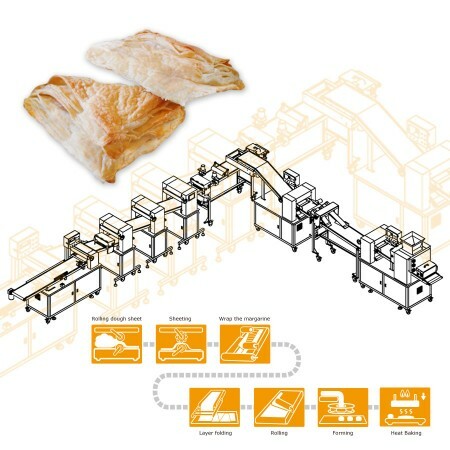 Even the complicated production of puff pastry can be automated！Customized Puff Pastry Production Line is exactly tailored to produce food with multiple processes, capable of processing dough weighing up to 600 kg per hour. For meeting different levels of automation, processing equipment such as cutter, wrapping device, fryer, etc. is optional to save labor costs and food. Moreover, we have years' experience in turnkey planning to assist customers build new production lines from the beginning, including ingredient processing, food producing, cooking and packaging devices, based on expected capacity and available space. Double or triple production lines are also provided for enhancing capacity and efficiency.